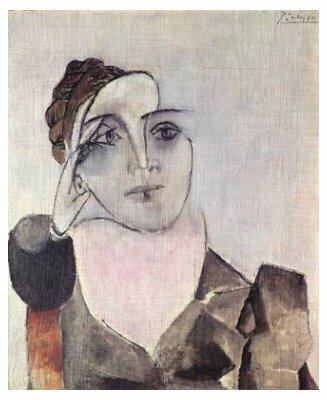 Less than four months after the start of their relationship, Picasso depicted Dora as melancholis, her hand pressed against her forehead. Her face which had remained intact, now for the first time underwent the famous frontal/profile split which, though barely noticable here, nevertheless suggests a black mood. The hollowness of the cheek is most likely a sign of the mind's flight, a schizophrenic slide. The images that followed, also done in November of 1936, clearly portray her as an insane woman with a grimacing and swollen face, dilated eyes, and convulsive postures.